PRESS RELEASE: eJamming Inc and Fender Musical Instruments Corporation are proud to announce an exclusive long-term agreement to jointly market and co-brand each others' products and services. The agreement is highlighted by eJamming AUDiiO, eJamming Inc's breakthrough software technology. eJamming AUDiiO provides patented synchronized streaming live audio over the Internet in real time, enabling musicians and singers anywhere in the world to create, play and record together live and online, while experiencing no discernible latency on their instruments. Now, any musician, for example a guitarist and bassist - acoustic or electric; beginner, student or professional - can collaborate, create and record music with other musicians and singers in a real-time online session over eJamming AUDiiO. "Fender is a company that has always been known for innovation, and this is another important way for us to connect with our customers and their evolving needs by offering them the ability to musically connect with each other online in real-time," said Richard McDonald, Fender senior vice president of global marketing. "We're very proud of this association, and we look forward to all of the creative collaboration that musicians worldwide will be able to experience through this exciting product." As a marketing partner, Fender will promote eJamming AUDiiO through special offers and other promotions including in-store events, demos and tutorials, and other exciting new online content at Fender.com. "eJamming's AUDiiO software is game-changing technology for music creation and collaboration," said eJamming Inc CEO Gail Kantor. "We know there's a great need and desire among musicians to use the Internet to collaborate in real-time, and AUDiiO delivers the experience in compelling ways with an easy-to-use interface and high-fidelity features. "We're thrilled to have joined forces with the legendary Fender Musical Instruments Corporation. Fender's highly regarded products and eJamming's innovative software form a powerful team to bring this new music creation service to musicians everywhere." eJamming AUDiiO provides a virtual rehearsing and recording studio for the estimated 150 million broadband-enabled musicians and singers worldwide. With eJamming AUDiiO, musicians can write, rehearse, arrange, learn, practice, play and even record with each other over the Internet in real time and in sync. All they need is access to a computer, a broadband connection, an audio interface device and a microphone. "Now, Fender guitarists and bass players can plug into a G-DEC 3 and get that signature Fender sound when gigging with musicians through eJamming AUDiiO," noted Alan Jay Glueckman, eJamming chairman and president. "No matter how great the distance separating players, eJamming AUDiiO instantly connects them over the Internet to a world of musicians, empowering them to collaborate, compose, record and express their creativity. The spirit of innovation thrives in both Fender and eJamming, and we're very excited about the revolutionary impact that the two companies' work together will bring to music making around the world." eJamming AUDiiO achieves long-awaited real-time synchrony by incorporating sophisticated algorithms that effectively resolve the delays associated with transmitting data over the Internet (which have prevented efficient real-time online music collaboration in the past). eJamming AUDiiO achieves real-time synchrony among multiple musicians in different locations, enabling musicians to keep solid time, which is essential for quality musical performance. 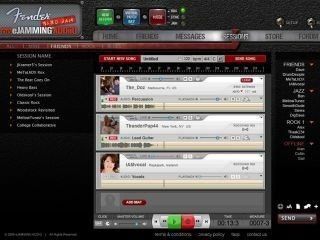 By wrapping a social network around a peer-to-peer connectivity client software with patented technology that synchronizes live audio streams from multiple locations - even continents apart - up to four musicians can play together in an eJamming session in real time for maximum creativity and enjoyment. eJamming AUDiiO is now available through www.fender.com/eJamming for a 30-day free trial. Subscriptions to eJamming cost US $9.95 (monthly), US $24.95 (quarterly) and US $89.50 (annually; equivalent to three months free).